Mason Loeffler of Evergreen dribbles the ball between a host of Delta defenders during a non-league contest this season. He was recently named honorable mention All-Ohio in Division III. 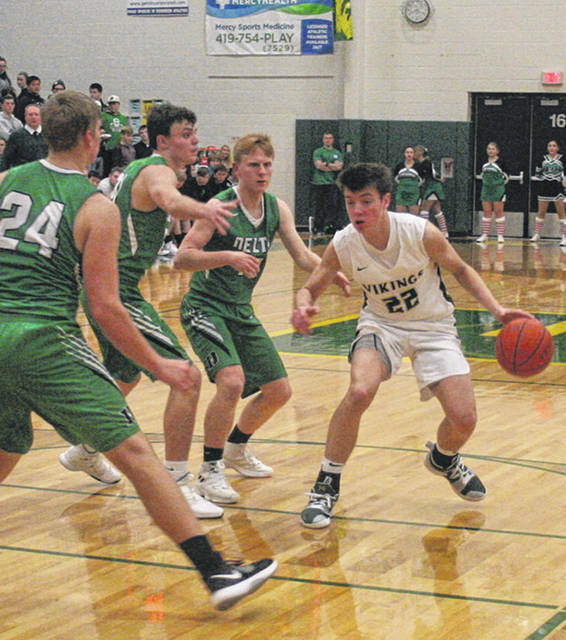 Boys basketball players from all over the state were awarded last week when the All-Ohio teams were announced by the Ohio Prep Sportswriters Association. Locally, Evergreen junior Mason Loeffler was named honorable mention All-Ohio in Division III. Joining him in the division were fellow Northwest Ohio Athletic League athletes from Archbold. Austin Wiemken made the All-Ohio third team for the Blue Streaks, while Jeron Williams was honorable mention. Archbold mentor Joe Frank was the Division III Coach of the Year. He led the Streaks to an undefeated regular season.